I’m shopping for trailer quotes from manufacturers in Iowa, and realizing it’s somewhat difficult to convey exactly what I need. For anyone interested, here’s my list of desires in a custom trailer. 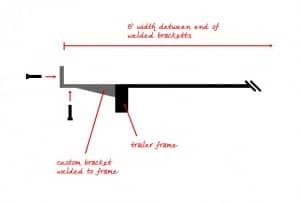 I want custom brackets welded to either side of the trailer frame, to effectively increase the width of the frame in some places (intervals everywhere but the wheel wells, of course) to the full 8 feet. 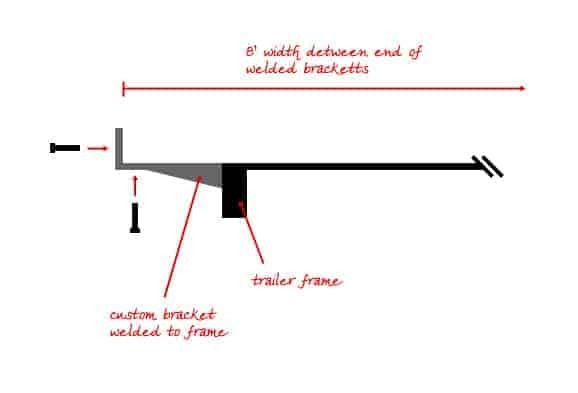 I want to be able to bolt my sub-floor framing to the trailer from the bottom and the sides, and would like a solid steel bracket in place to do this (instead of trying to bolt through the trailer decking, or welding on flimsy, unfinished brackets to the frame, that do not span the 8 foot width, and only allow bolting up from the bottom). This may not make much sense in words, but the handy diagram to the right should make it pretty clear. I’ve consulted a few books on the subject, and tried to gather as much info as possible from other people building processes, but I’m not completely sure this is the easiest way to go about it. How are you attaching your sub-floor to your trailer? Did you ever find your trailer with your spect requirements? I’m looking for the same, 18″ deck height, 22-24′ long an gvw of 10-12k. Additional side brackets can be added later. Thanks! I don’t know how I lost track of this but finally found your reply thanks, and sorry this is so late. I like what you found. I’m book marking it and checking it out for myself. Thanks again! Hi – I’m doing research on trailer specs and ran across this post. I have a very constrained area in which to build my tiny house, and at most I have space for a 20′ trailer with a 4′ tongue. I’m trying to see how far out onto the tongue I could build a box bay, and I noticed you actually built your propane deck and shed onto the tongue at the full width of the trailer (rather than a 6′ wide bay which I’m considering) – I’m guessing it’s about 18″ deep. Did this cause any turning radius problems while towing? Also, in this post you say you had the trailer manufacturer move the tongue a foot forward – was this so you could build the shed and propane deck? Did this make your tongue longer in the end? Thank you so much for any advice – I’d love to be able to maximize every possible inch so that my house can be just a bit bigger! That sounds like a perfect compromise. Contact me via email and I’d be happy to talk through more details. Can I ask what they charged? I’m also in Iowa and am looking at my options. My trailer was $3,250, though they may have given me a bit of a deal. They are a great company and John did a great job at translating my needs into a excellent final product. They have now made several other tiny house trailers based on the design I came up with including the added brackets that extend the width to 8ft. I VERY highly recommend them. If cost is an issue, try to save that money elsewhere and invest in a good trailer. Your foundation is very important! I am looking into building my own trailer, but cannot find any specs on steel tube guages and sizes. Any info on that kind of stuff? Hi Heidi. I’m not an expert on trailer construction. I had mine built professionally by https://www.mac-lander.com/. If you are having them build the trailer to 8 ft. Then the brackets will make the bed of the trailer wider. You have to space between the brackets at 8ft. That’s not possible, if the trailer is already 8ft to start with. You will be extending the trailer width, by the size of your bracket x2 (one on each side) . So, if you have 3″ brackets. The distance between the two opposite brackets, will be 8.5 ft. The width of a trailer frame (between the wheels) is not a full eight feet. It’s something like 81 inches in my case. The brackets extend that surface to 8′ wide. Remember that you have eves that extend beyond your walls. The trailer and eves can’t be more than 8′ wide. I had my trailer built with the bed extended to 7′ 8″ in front and in back of the fenders, allowing for a tiny eve overhang. The frame itself is 7′ 8″ wide (except at the wheel wells), which is the width of my house wall to wall, so I don’t need brackets and don’t need to “overbuild” the house on the frame. I can run my sole plate for the walls right on top of the trailer frame. To fasten it, I’m going to drill into the frame and also have a piece of angle iron welded to the inside edge of the frame to drill through and fasten the sole plate, so the sole plate can be fastened in a more stable, zig-zag pattern. I’ll also fasten the subfloor to the inner trailer frame channel steel as well as to the sole plate. My trailer was built by the Trailer Factory in Miami, FL. my contact was [email protected]. They want to become the tiny home trailer supplier in southern FL. Mine was their first tiny house trailer. Damian was extremely patient and accommodating as we figured out exactly what I needed. It took two weeks to build. Oh, also my trailer outer frame (2″ x 5″ channel steel) is 16 gauge (1/8″). That’s what the manufacturer uses for their standard dual axle trailers. I contacted Tumbleweed Tiny Homes and asked what gauge they use, to see if it’s the same, and they won’t tell me. I’ve asked them three times and they respond with specs that don’t have the info. or give me the 5″ x 2″ dimensions and finally asked me why I wanted to know. I told them I just want the info. and I think its a reasonable request. If anyone else knows the gauge steel on Tumbleweed’s or any other tiny trailer please let me know! Did you ever find out the thickness of steel they used? I have been trying to find out as well and nobody, including research online, will give me any info. Just by looking at heavy duty car trailers they look to be 3/16 thick on main frame. Thanks, Susan. This is very good info. However, in all states that I know of (maybe FL is different), you can build to 8.5′ wide, not 8′. I framed my house to 8′ wide to allow for a few inches on either side for very short overhangs and other things that may stick out. I’m very curious as to if it’s possible to build “living” space on top of the tongue of the trailer, basically I’d like to extend the bed 9″-18″ onto the tongue, because I’m already going with a 32′ trailer and have big dreams for the perfect Tiny House bathtub! So is it okay to build a few inches of “living” space onto the tongue? Thanks! Yes, it’s possible, but be very careful how far you build out. It depends on exactly how your trailer is engineered, but if you build out too far you will end up limiting the turning radius so much that you won’t be able to tow your house. The safest way would be to build on the trailer only in a triangle shape that matches that of the tongue itself. If you bring the full with of the house onto the trailer, then you may not be able to go far at all. Even 9″ could be risky depending on the dimensions of your trailer tongue. Please check with the trailer manufacture or physically hook up the trailer to your tow vehicle and test it (that’s what I did). I am working on my plans to build my own tiny home and I am trying to find the average height of the trailer from ground to top of the deck but I can’t find any websites that give the specs other than length/width/GVWR of axles. I don’t want the lowered axles, just standard height so I can plan the height of walls and roof…can you help me out with that? You should call a few trailer manufacturers to get the exact specs, as I’m sure they all vary a bit, but you can expect it to be close to 24 inches off the ground as a rough approximation. thank you for the answer, and you were spot on. I did reach out to a few manufacturers and 24 inches seems to be about the standard.